WorkbenchesWorkbenches are essential in any type of work as this is where all the “action” happens. A good workbench should be able to properly fit the physical and functional requirements of the task assigned to you. Here at Krosstech, we have different types of workbenches depending on what you are looking for. We have three types of heavy duty workbenches that’s durable and can support any heavy duty task you need to do. We also have two types of modular workbenches that keeps functionality in mind. 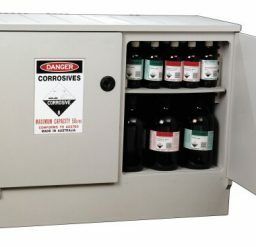 Lastly, we offer an industrial tool cabinet that can safely house all of your essential equipment. What makes our workbenches stand out? All our workbenches are designed to withstand any type of beating for a long period of time. It’s safe and easy to use plus we have various options available to help you find the perfect workbench for you. Krosstech will help you finish your tasks hassle-free with the workbench that matches the industry you are in. "Thank-you for your prompt and efficient service, it was greatly appreciated and will give me confidence in purchasing a product from your company again." "The sales staff were excellent and the delivery prompt- It was a pleasure doing business with KrossTech." "We are really happy with the product. It’s done wonders for our storerooms." "It’s been a pleasure dealing with Krosstech." "We love Krosstech Surgi Bins as they are much better quality than others on the market and Krosstech have good service. Thank you." "We have recently changed our Hospital supply of Wire Bins to Surgi Bins because of their quality and good price. Since ordering them they always arrive quickly and well packaged." "Krosstech has been excellent in supplying our state-wide stores with storage containers at short notice and have always managed to meet our requirements. " "Fantastic service, really appreciate it.It is refreshing to receive such great customer service and this is the 1st time we have dealt with you and Krosstech.Needless to say we will be dealing with you again soon."